Win Whitney: The true story of a musical legend | SWITCH. Whitney Houston broke more music industry records than any other female singer in history. With over 200 million album sales worldwide, she was the only artist to chart seven consecutive U.S. No. 1 singles. She also starred in several blockbuster movies before her brilliant career gave way to erratic behavior, scandals and death at age 48. 'Whitney' is an intimate, unflinching portrait of Houston and her family that probes beyond familiar tabloid headlines and sheds new light on the spellbinding trajectory of Houston’s life. Using never-before-seen archival footage, exclusive demo recordings, rare performances, audio archives and original interviews with the people who knew her best, Oscar-winning filmmaker Kevin MacDonald unravels the mystery behind “The Voice,” who thrilled millions even as she struggled to make peace with her own troubled past. The 'Whitney' competition has now closed. Winners will be announced shortly. Competition opens at 5pm AEST on Sunday 15th July 2018 and closes at 11:59pm AEST on Sunday 22nd July 2018. Five winners will be chosen at random on Monday 23rd July 2018. To successfully win, entrants must fulfil the above entry conditions before the time the competition closes. Current members/followers are eligible to enter the competition. Only one entry per person. Only one winner per household. To be a valid winner, the entrant must not have won a prize from SWITCH within the last 28 days. Each winner will receive one double pass to 'Whitney'. By entering, you agree to receive occasional emails from SWITCH in the future. If you decide to unsubscribe from these updates, any further entries will not be applicable. Only Australian residents are eligible to enter. 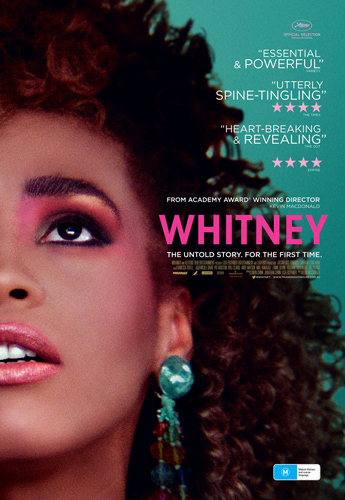 'Whitney' is in cinemas from Thursday the 26th July 2018 through Transmission.